own festival. The 200 years of history in Nepal when the Shah monarchy ruled the nation they forcefully ladened and made them celebrate Dashain as a main festival of the country. They also made the nation as Hindu depressing more than half of the population who were not Hindu. If they didn't celebrate, they were punished and sentenced to the prison, with that fear everyone should have celebrated the Dashain and slaughtered the animals in the name of Goddess Durga who is considered needs the fresh blood of the animal during the Navratri of Dashain which is the ninth day of the festival. Thousands of animals sacrifice their lives as they are killed by cutting the throats and their blood spills over to the mouth of the Goddes. The Nepal new constitution has already declared that Nepal is a secular nation and everyone has a freedom to have own faith regarding the religious issues, but still the government is providing the special holiday during this festival. 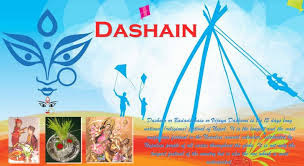 All other religious people demand the equal treatment, they need the equal holidays on their major festivals, but the nation considers the Dashain is the biggest festival. That is the reason it is controversial among the diverse people who have a different religion, different belief and different perception about the major festival. The history of this festival is connected with the victory of Goddess Durga who won the demon on the tenth days and people started to celebrate the days as a victory day. On the tenth day of this festival, the elder people give the blessings to their young generation with Tika. On the other side, the history also says it is the celebration of Victory of Ram over Ramayan. The expert of the indigenous people believes that the Ramayan was the ancestor of the indigenous people, the Victory of Hindu over other non-Hindu was forcefully ladened to the people who were defeated. Despite having the several reasons of celebration, one of the positive parts of this festival is gathering of the family and blessing from the seniors. Due to globalization, awareness has risen to the peak and people know that it is the human rights to have the religious freedom and it was dictator kingship, who forced the people initially, but now they are aware of that and it is their interest whether they want to celebrate or not. Nobody can force to celebrate if it is against their beliefs and thoughts. In addition; several Buddhist people live in Nepal who is against the violence. In Buddhism slaughtering the animal in the name of the festival is a great violence. The major drawback of this festival is killing the animals in the name of the goddess that is against the animal rights. It has many things those are against the modern socialism because people have tempted a passion to buy new clothes, eat delicious food and buy new ornaments in the name of the Dashain. It is okay for the people who have enough money and can spend on what they want to have, but it is always hard for them who have problems to cover their arms and to fill the empty stomach.